Whether you idly wonder about the people you follow in line or chew that last fingernail while papers are being graded; whether you file your taxes while on hold or file your nails in traffic jams; whether you have bused tables, busted a bone, or merely stood in the rain for a bus, you have joined the millions, past and present, who have waited. It doesn’t matter whether you are anticipating a happy event or dreading an unsure outcome, that particular tension associated with marking time has gripped us all. We anguish and pace or kneel and pray as we wait for news, a name to be called, a change in fortune, our turn, a beginning, or an end. We have kept all-night vigils, counting the seconds that span the chasm between wondering and knowing. And we have charged into the breach willy-nilly because we can’t stand to sit idly by. Whatever the course of action, the goal is always the same: make the time go faster. Keep us company as we share our musings…fears, joys, and observations while waiting. The Silver Boomer Books partners were delighted to have this anthology proposed by Melody Mann. They recruited Judy Callarman to round out the editorial team and it has been a delightful team effort. Melody was born as a young child and has lived her entire life. She currently lives with a Mann and has borne four Mann children. When not helplessly proofreading every billboard and cereal box she encounters, she earns a wage as a Tech Editor heroically rescuing dangling participles. She blames her career path entirely on her first grade teacher, Mrs. Campanella, who blithely inflicted literacy on over 35 unsuspecting children that year. Growing up in a military family, Melody spent untold hours waiting in one form or another, in one assignment after the other. A book or puzzle magazine was a more faithful companion than any pet could ever be and always spoke her language. She was delighted to pass the skill of waiting on to her four children. (One of whom still regularly causes her mother to practice late into the evening.) Having ingested a multitudinous amount of alphabet over the years, Melody thought it was high time to regurgitate. 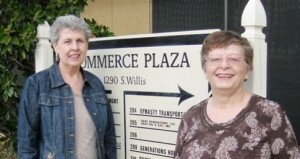 Judy Callarman lives in Cisco, Texas. 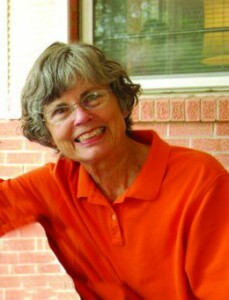 She is a retired professor of creative writing and English at Cisco College and chair of the Fine Arts Division. 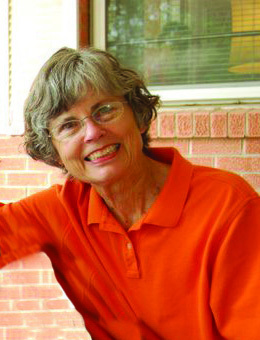 Her poems and nonfiction have won contests and been published in Silver Boomer Books’ This Path and From the Porch Swing; Radix; Passager; Grandmother Earth; and Patchwork Path – Christmas Stocking. Becky Haigler and Barbara Rollins, the other two editors, are profiled in here. and leave off the title. What do you mean haiku have no titles!? is it the house or a cup? What cup? She says the cups are broken. I don’t buy it. Let’s leave it out. …got to have some different titles! all her essays sound alike. squack is not a real word. Does it bother the editorially minded? I hate to mess with the Muse. Is it the horse or a dog? What dog? She says the dogs are dead. I’m going out of town for the weekend. I have company coming in. I can’t get a decent wi-fi signal. No, I mean vote on this…please. 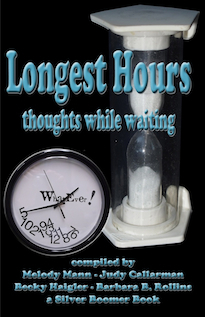 Click the button below to order your copy of Longest Hours for $14.00 US plus shipping costs and, in Texas, sales tax. Note to Longest Hours Authors: Please email us at SilverBoomerBooks@gmail.com for your author rate if you wish to purchase more copies – and thanks!